(Photo credit: NASA) Melting of permafrost is releasing trapped methane into the atmosphere. December 7, 2013–A characteristic of much of the land surrounding the Arctic Sea is a phenomenon known as permafrost. Permafrost is ground which is frozen in winter. In summer the ground surface melts, but does not melt down far enough to thaw the frozen soil all the way to the bottom. Along the southern boundary of the permafrost, the temperatures within the soil are close to the freeze-thaw temperature. Only a slight increase in temperature can melt permafrost over large areas. Along this boundary, the permafrost is melting downward at a rate of about three feet (1 meter) every ten years. Around the base of Mt. McKinley large areas of arctic meadow have turned into a mix of ponds containing water-loving plants and dry meadows. 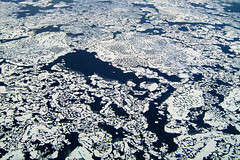 Much of the melting of the permafrost has taken place in the past several decades. Permafrost is not restricted to North America. Somewhere between 20 and 25% of Earth’s land area contains permafrost. In China, the permafrost is estimated to be melting northward at the rate of about 1.6 km (1 mi) every year. Around the Arctic Sea the permafrost is now completely melting in summer on the southern margins. Methane (CH4) is a greenhouse gas found in small amounts in the atmosphere under natural conditions. It is a gaseous hydrocarbon that is clear, odorless and flammable. It forms in the natural world largely from the decomposition of organic matter. It has begun to accumulate during the past two centuries. Since 1750, the level of methane has more than doubled from about 700 to 1800 parts per billion (ppb) in 2013. The current level is the highest in at least the last 650,000 years. About half of the increase has occurred since 1960. The additional methane comes from a variety of sources including agriculture, mining, and manufacturing. Permafrost provides a barrier for gases trapped beneath the frozen soil and ice. A large amount of methane is trapped beneath permafrost and ice covered lakes, perhaps trillions of tons. Some of the methane has been trapped under the ice for hundreds of thousands of years. Rapid melting of the permafrost is releasing trapped methane into the atmosphere. The melting of sea ice and decomposition of vegetation at the bottom of ponds and lakes contributes to the methane emissions. Ice capped seeps are mainly found along the boundary of the permafrost. They are also found around the retreating margins of glaciers. Scientists have recently documented 150,000 methane seeps in Alaska and Greenland. In Russia more than 100 methane fountains have been found, some more than one-half mile wide. These fountains send methane directly into the atmosphere. On a global basis, methane is now second to carbon dioxide in volume of emissions. It accounts for about 23 % of greenhouse gases. The combination of CO2 and methane combined account for 93% of greenhouse gas emissions at present. Water vapor normally is not present in any significant amounts above the troposphere. Methane rises in the atmosphere, passing through the troposphere to the stratosphere. In the stratosphere the sun breaks down methane and hydrogen oxidizes to form molecules of water vapor and ice crystals. The accumulation of water vapor and ice particles forms thin clouds. These clouds reflect Earth radiation back to the surface, compounding global warming. Computer models show that a doubling of methane into the atmosphere could increase water vapor in the stratosphere by approximately 30%. Because global warming is most rapid in sub-Arctic regions, rapid melting of the permafrost is taking place and increasingly releases methane into the atmosphere. The release of methane in sub-polar regions is self perpetuating. If more methane is released into the atmosphere, it will lead to still more warming and more methane release. If only one percent of the methane known to be buried in the ground were emitted to the atmosphere, it would have double the warming effect of all greenhouse gases placed into the atmosphere to date. Categories: Climate Change | Tags: Arctic, Arctic methane release, Arctic Ocean, Greenhouse gas, Nature Geoscience | Permalink. Ѕomebody essentially lend a hand to make seriously posts I would state. This is the verу fiirst time I frequenteԁ your weеb page and to this point?